Sarah Nader - snader@shawmedia.com Students enjoy the lobby at the new Health and Life Sciences building at Elgin Community College on Wednesday, March 14, 2012. Sarah Nader - snader@shawmedia.com Ann Cobb (left) of Elburn and Kristin Jordan of West Dundee practice different techniques on each other while attending their physical therapy class in the new Health and Life Sciences building at Elgin Community College on Wednesday, March 14, 2012. 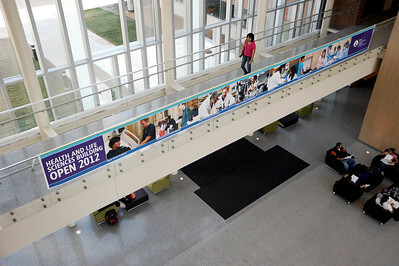 Students enjoy the lobby at the new Health and Life Sciences building at Elgin Community College on Wednesday, March 14, 2012.